Well, it's not even noon and my to do list has become my already done list. Granted, there were only 3 tasks on my to do list, but I like to aim for achievability. Don't want to damage my self-esteem by making my to do list impossible...like, by putting more than 3 items on it. 3. Made banana muffins with my "helpers" using the.best.banana.muffin.recipe.ever. Aren't you proud of me? I did all 3 things on my list! And maybe you can understand now, why I strive to keep my to do lists from being overly ambitious. One day several years ago, I wanted to make banana muffins but discovered that I had no margarine or butter in the house. Since we lived 40 minutes away from the grocery store back then, I went on a hunt for a butter and margarine-free banana muffin recipe and found this one in a fundraising cookbook. It was a happy accident, because these banana muffins taste so good. I mean, I liked banana bread before, but after finding this recipe I loved banana bread. Blend in 1/2 c. chopped nuts (I use walnuts). Bake at 350*F in a loaf pan for an hour or in 18 muffin tins for about 25 minutes. Tip: I don't know why, but some people, including a few in my own family, don't like nuts. To make some with nuts and some without, just leave out the nuts and put some of the batter into muffin cups. Then, when you have enough nut-free muffins, just stir some nuts into the remaining batter and divide between the remaining muffin tins. To easily distinguish the two, I use muffin papers for the muffins that don't have nuts. I have been trying to increase my repertoire of meatless entrees for several reasons, but my Hubby is a meat-and-potatoes kind of guy, who believes a meal is not complete unless it contains meat, potato, vegetable. Apparently that's the bare minimum: it's better if the meal also includes bread and cheese. I'm told it's a Dutch thing. We rarely have potatoes with our meals anymore, but I doubt my husband would take kindly to the exclusion of meat as well. Then there's the fact that the children don't like beans, and none of us like meat substitutes like tofu or TVP. The other day we tried Meat-Free Fajitos (Fajita-Style Burritoes), which I found in the latest issue of Every Day With Rachel Ray. In a large cast-iron or other heavy skillet, heat 3 tbsp. oil over medium-high heat until smoking. Add the mushrooms and brown for 10 minutes. Add the remaining 1 tbsp. oil, the bell pepper and onion and cook, stirring, until crisp-tender, 2 to 3 minutes. Add the jalapeno, garlic and thyme; season with salt and pepper. Cook, tossing, for 2 to 3 minutes. Pour in the sherry to deglaze the pan; lower the heat to a simmer. Meanwhile, char the tortillas on each side over an open flame or in a dry skiller. 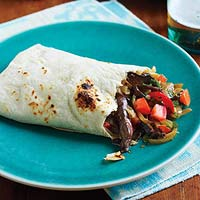 Fill the hot tortillas with the manchego, mushroom filling, tomato and cilantro. Tuck in the sides, wrap and roll tightly into a burrito. It looked and smelled so yummy as it was cooking! It also tasted delicious and was surprisingly filling. Unfortunately, it met with only a 40% approval rating (AKD said it just needed some meat and then it would be really good; MC thought it tasted good when we forced him to at least taste it, but still didn't want to eat it once, let alone eating it again at some time in the future). *Sigh* I decided to keep the recipe, but I won't be making it again anytime soon... You should definitely try it, though. Yum! If you have any non-cheese-bean-tofu-TVP vegetarian entree recipes that you'd like to share, please do! For those of you who don't know (and I'm guessing that would be...most of you), I have a small benign tumor on my pituitary gland. The pituitary gland is located in the brain, just behind the eyes, so if I want to be sensational I could say I have a brain tumor. It's not a huge hairy deal, though: it's not going to kill me and is easily treatable. It is unclear whether the tumor itself produces prolactin or if the tumor causes the pituitary gland to produce prolactin, but the result is more prolactin running around in my bloodstream. Just like it sounds, prolactin is a hormone that aids in milk production, and since I won't have any more babies to feed, I really don't need extra prolactin. If you'd like a little more information about my type of tumor, University of Michigan has a good overview. Since its discovery in August of 2006, I have been on medication to shrink the tumor, or at least inhibit its growth, for a total of about a year and a half. When I was on a lower dose, I felt terrific--the best I had in years--all that dopamine bouncing around in my head. When I was on a higher dose, which really wasn't all that high in the grand scheme of things, I felt like I was going to die. Regardless of side effects, I hated being on a daily medication. Every day, when I put that pill into my mouth, I was reminded that there was something wrong with me. Something that I couldn't see or feel; something no one could tell by looking at me. The rest of the time, especially when I was on a lower dose and felt great, I could almost forget about the tumor, but every time I opened our medicine cabinet, there was the prescription bottle, front and center, testifying to the foreign invader in my body. It's unsettling, to feel fine, but know that something is wrong with you. It makes you wonder what else might be lurking in your body, ready, at any moment, to pounce, stealing your health away with no warning. It is a harsh reminder of our human fragility and the random cruelty of this mortal life. I've been off the medication now for almost 3 years, but lately there have been signs that the tumor has been growing again. A recent blood test showed an elevated prolactin level, which means it's time to take its picture again, see what it's been up to. I hate this. I hate this thing that has taken up residence in my brain, over which I have absolutely no control. Do you ever feel like you have so much to do, you don't even know where to start? It can be overwhelming. We all know that large tasks become infinitely more manageable when they're broken down into intermediate steps, but what happens when you can't even get your mind around organizing the task into smaller steps? How do you prioritize? How do you decide what to do first, and then how do you keep yourself from feeling guilty about not doing all of the things you didn't decide to do first? How do you keep yourself focused on that first step so you are able to actually complete it, rather than being pulled away to start another job until you end up with 20 bazillion started, but unfinished, tasks? Recently I read Sidetracked Home Executives: From Pigpen to Paradise, by Pam Young and Peggy Jones, because it was mentioned in another book that I'm reading. "Sidetracked" is a perfect description of what happens when I'm doing household chores. Why, just yesterday, I was picking stuff up in my bedroom, and there was something that needed to be put away in the bathroom, and when I was in the bathroom I found something that needed to go to the kitchen, and when I was in the kitchen I discovered that we needed more paper towels, so I went to the storage closet and then I wandered aimlessly around until I found myself in the laundry room, and when I was in the laundry room I decided I might as well take the laundry out of the dryer and dump it on my bed and oops! What was I doing? Oh, right, tidying up my bedroom. Did you notice that my story didn't even involve any children? Yikes. Add two or three rug rats into the picture and it gets exponentially more complicated. Sidetracked. Anyway, Sidetracked Home Executives is a really quick read, and those ladies have created a phenomenal system for staying on top of everything home (and life) related...but it's not for me. I've tried a modified version of their system in the past, and it's never been life-changing for me the way it's apparently been for the authors and thousands of others. But there is one thing I learned from those ladies that I will be putting into practice. How do you decide where to start? How do you decide what's most important--the highest priority? Don't. Just pick an arbitrary point (for them it's the front door), and work your way clockwise around the house, dealing with each area as you come to it, until you've worked your way all the way back to the front door. So simple, why didn't I think of that? It's not rocket science, nor is it a matter of life or death (well, not in most cases, anyway), so just pick a place to start, and work methodically until it's finished. The consequences of choosing the wrong place to start? Um, well, I can't really think of any, and at least it's a start. It is so liberating to know that I will get to it eventually. I will get to all of it eventually. It doesn't have to all be done today. No more time wasted trying to figure out the most important thing. No more feeling guilty about all of the things I didn't choose. And to know exactly where I need to pick up in the circuit the next time I find myself with a few spare minutes? Priceless. It isn't a secret that for me, the time between when MC gets home from school and we sit down for supper is the busiest, most stressful time of the day. You see, because of school and extracurricular schedules, there is just one hour during which I must get supper on the table, supervise MC's homework, and keep Bubby occupied and away from his brother, who is trying to focus on school work. It's hard to do. Near impossible. I have enlisted big brother AKD's help in keeping Bubby occupied and out from underfoot, which has been a lifesaver, but MC requires more focused attention than I can give him while I am also cooking. Plain and simple: I need more help. These little piggies may not be pretty--my helpers aren't too skillful--and they may not be the best nutritionally, but they are done: ready to go in the oven. Um...I think I'm gonna need a little more help...please! Just in case there is anyone reading this who doesn't know how to make little piggies, you will need a package of cocktail wieners and 2 tubes of crescent roll dough. Pop open the crescent roll dough and separate each tube into 8 triangles. Cut each triangle in half lengthwise (so now you have a total of 32 long skinny triangles). Place a cocktail wiener on the wide end of each triangle, and roll up. Place on a baking pan and bake at 375*F for 13-17 minutes, or until golden brown. I linked this post to Whatcha Making Wednesday at The Ramblings and Adventures of a SAHM. Whatever else this winter has or hasn't (ahem: snowy) been, we have had some prime snowman making snow (when we've had any snow at all). Pal and I worked together on this bunny/dog/snowman. He ended up taller than me! I am particularly pleased with the whiskers. Bubby made this snowdude all by himself--you can just make out two eyes and a nose on top. Later he added antlers. and please, let me laugh with them and be silly. and that my thanks and praise are thoughtful and given when they're due. without once pretending that it's mine; my children are glories enough. that I can dare to let them go. And oldie but goodie. Invite your kids to use a table knife to make crayon shavings onto a piece of wax paper. Put another sheet of wax paper on top, then use an iron on the lowest setting to melt the crayon wax and the wax paper together. Cut into a heart or other shape and display on a window to catch the light. Tip: darker colors tend to look murky when melted, so stay away from dark blue, purple, brown, gray and black. Cut a piece of sturdy paper into a square--ours is 9 inches. We used canvas paper left over from another project, but you could use posterboard, cereal box cardboard, or even cardstock. Place several quarter-sized puddles of light corn syrup on your paper. Start with 4 blobs in the corners. Squirt 1 or 2 drops of food coloring onto each syrup puddle. Use only one color per puddle and 2 or 3 colors total. Next, swirl the color around the page until its completely covered. We started out using popcicle sticks for this, but it quickly degenerated into finger painting, which is great for developing fine motor skills and sensory integration. Add more puddles to bare spots if you need more paint. Allow the corn syrup to dry--this could take a day or more, but it will dry shiny and beautifully marbled. Cut a piece of construction paper the same size as your painting, fold it in half and cut out a heart shape. Then glue the construction paper frame on top of the painting. I was really worried about this project--it was touch and go for a while, and it wasn't looking too good (imagine all of the places that colored corn syrup could show up if you let a 4 year old play with it)--but I am so pleased with how it turned out. I love it! This would be great in the fall with a leaf cut-out shape, or in winter with a snowflake or snowman. You could do a shamrock for St. Pat's Day...well, you get the idea, I'm sure! I rarely do anything special for my family anymore. It seems the arrival of our third child nudged me over the edge into survival mode, and I've been there ever since. I suppose you could say that, because I make supper for my children and eat it with them every day, or because I'm home when they get home, I'm doing something special. And I suppose it's true--there are many children (far too many) who don't have that. But to me, that's nothing special--that's just my responsibility. It's just too much work to do anything out of the ordinary for my family. It's not so much the implementation that I don't have the time or energy for, but the planning--the thinking it up in the first place. Some days I barely have time to breathe, much less figure out a novel way to show my family I love them. You may have noticed that yesterday was Valentine's Day. I know, it's a Hallmark holiday, conceived by businesses to guilt us into parting with more of our money, but if ever there was a day to do something special to show my love for my family, that was the day. And there I was, at 2:53 p.m., standing in my kitchen feeling guilty that I hadn't done a single special thing. No special meal. No decorations. No small gifts for my boys. No curtain of paper streamers with hearts on the end hanging in their doorways. No trail of Hershey kisses leading from their bedrooms to the kitchen. And certainly no treasure hunt. Nothing. The baby was finally "resting", the oldest baby was due home in 12 minutes, and I had nothing. Drawing inspiration from a book I've been reading, I decided I could at least make a simple heart-shaped dessert. I mixed 1/2 c. sugar and 1/2c. light corn syrup and microwaved until it was boiling. Next I added 1 c. creamy peanut butter and stirred until melted, then stirred in ~3 cups of rice krispies. I took baseball-sized portions and shaped them into hearts on waxed paper, then placed one on each plate. But was that special enough? Oh no! I'm not sure me giving them heart-shaped treats quite conveys the depth of my feeling, so next I had to tell my family how I feel about them. But mine was empty, of course, because 1. I have a hard time thinking of anything nice to say about myself and 2. even if I could think of something, it seemed a bit vain to actually write it down. As we sat down to dinner, we passed the hearts and each person wrote something nice about each family member. It was a sweet way to remind everyone that we do, indeed love each other, that each of us is unique and is worthy of admiration. I saved our hearts and put them up in our dining area to serve as a visual cue to appreciate one another. Our meal seemed to be a tad less hectic than usual, too, but that could just be me looking backward with a rosy viewpoint. How's that for special? And put together in 12 minutes or less? I guess my point is, it's always a good time to put a little extra effort into loving your family. And a little effort goes a long way toward creating positive family bonds, lasting memories, and a feeling of warmth in your home. He came into our lives quite unexpectedly, and has been a faithful friend through the years; he is dependable, strong, always ready and willing to help when we need him. We found him one day, abandoned, on the side of the road, and feeling sorry for him, we decided to bring him home with us so he'd have a chance at a future. We quickly discovered that our new friend was something special. The blade was curved at just the right angle, the shaft was just the right length, and he was lightweight, but strong. Over the past several years his strength has been waning; his physical integrity has been declining. With a sense of quiet desperation, I fear our friend will soon leave us. Due to the mild nature of this year's winter, he's held on, but we all know it's just a matter of time until our beloved friend bites the dust. We knew the relationship couldn't last forever, but our friend has been with us longer than we have had our children--he has become a part of us--and this protracted goodbye, this prolonged mourning, is agonizing. Oh, we've looked around for a replacement, but none of the others even comes close to the perfection we have found in our treasured friend: our snow shovel. We've spent countless hours together, the shovel and I, pushing the snow across the driveway--no, three driveways--over the years. There is something so satisfying about this simple, mindless activity: something so calming and meditative about methodically clearing snow. My progress is both noticable and measurable: I can see where I've been and what I've accomplished, in the straight rows of bare pavement left in my wake. Precious little else in my life shows success so plainly. Shoveling is a process that cannot be rushed, and as my body moves: scrape, scoop, shovel, scrape, push, the frantic quality of my thoughts clears. The weight of the snow grounds me; the crisp, cold air chases my anxieties and worries away. For those few moments of shoveling, all is well with the world. I am useful; I am strong. And my shovel, my partner in meditation, is losing its edge. Quite literally. After over a decade of searching and failing, I fear that I will never find another so perfect. And so today, I grieve for the final goodbye that is to come. The other day, we made these beautiful windowpane heart cookies, just in time for Valentine's day. They were so simple to make, but look fabulously complicated--just my kind of recipe! You can use any kind of rolled-out cookie dough for the base. The advantage of the recipe we used (from Family Fun Magazine) was it didn't have any leavening, so the cookies didn't spread as they baked. First, roll the dough 1/4 inch thick and cut into heart shapes with a fairly large cutter--ours was about 4 inches across. Then, cut a smaller heart shape in the middle--the cookie cutter we used was about 2 inches across (I used my Wilton Nesting Heart Cutter set). Then, transfer the cookie cut outs to an aluminum foil-lined baking pan that has been lightly greased, and place an unwrapped hard candy (we used jolly ranchers) into each cut-out. Place in a 375*F oven and bake for about 8 to 10 minutes, until the candy has melted and the cookies start to brown lightly around the edges. When AKD was an itty bitty, we taught him to write his name. In upper case letters. Because that's what people do. Because, in general, upper case letters are easier (although, thinking about the letters in his name, it's about the same either way). Right then and there I vowed that my future child(ren) would learn the right way from the beginning. With MC, I was successful. Bucking conventional baby-writing methods, I insisted that he, from the beginning, use an upper case first letter, followed by lower case: Mcblue. Now, my baby Bubby. He's 4, you know. All of his friends can write their names (in all upper case letters). Valentine's day is coming up, and you know what that means: his teacher thinks this is the perfect occasion for the kidlets to practice writing their names (ohmyword, the struggles we had on V-day when MC was in kindergarten...and first grade). He's getting better, he really is, but the formation of a couple of his letters evades him. It's a difficult letter to write. You have to start in the middle and curve, and keep curving, the correct way, and it just never turns out right. "E", on the other hand, is so much easier. Just 4 straight lines. One of the other letters in his name is significantly easier in upper case as well. So, on Monday, after several illegible V-tines attempts, I gave in. I printed his name in all upper case letters for him to copy: ROGER. And he did it. But now...now he's going to have to unlearn it. What a terrible mommy I am. Again. Funny story: Bubby and I talk about upper and lower case letters a lot, probably more than the average mommy and 4 year old, about whether a letter he recognizes is upper or lower case and how they're the same letter, just written differently. But Bubby calls them upper case and downer case :) Is this one downer case, mommy? So cute! Makes sense, right? Down is the opposite of up. As promised, here are instructions and a picture of the heart-shaped sun-catcher mentioned in my February craft of the month post. ~ various scraps of craft supplies, like paper, tissue paper, lace, ribbons, doilies, sequins, whatever--just make sure your supplies are relatively flat. Oh, and some should be translucent. It also helps if they're all in the same color family (we're using red, pink, and white). 1. Fold the construction paper in half and cut out a heart shape. Keeping the paper folded, cut again, about 1 inch in from your original cut line, so you end up with a heart-shaped frame. 2. Cut a piece of clear contact paper big enough to hold your heart frame. Peel the paper backing carefully away from the contact paper, place the contact paper sticky side up on your work surface, and place the paper heart frame on top. 3. Now, the fun part--decorate! Just stick little pieces of whatever craft supplies you gathered to the contact paper inside the heart frame. 4. When you're finished decorating, cut another piece of contact paper, big enough to cover the frame. Carefully peel the backing off the contact paper and place it, sticky side up, on your work surface. 5. Place your decorated heart, sticky side down, on top of the contact paper and smooth out any wrinkles. 6. Finally, cut away the excess contact paper from around the frame. 7. Hang in a window, where it will catch the light, and enjoy. Do you make your bed every day? I didn't used to. I figured there was no point considering I was just going to be getting back in to it again at the end of the day. Plus? Back when I had to be somewhere at an early hour every day, I wasn't willing to get up the extra 5 minutes early that it would have taken me to make the bed. Then I started working part time, and I didn't have my no-time-in-the-morning excuse anymore, so I started making my bed. After I had children, making my bed became an important daily ritual. You see, if I made my bed in the morning, no matter what else happened that day, at least I had accomplished that one thing. Those of you with children, maybe you understand. Plus, if I made my bed in the morning, no matter what happened in the rest of the house (hundreds of legos dumped out all over the floor, paper shreds everywhere, you get the idea...) at least that one room of the house was tidy. If the bed was made, I had a retreat from the chaos that often ruled in my world. So, for the last 13 or so years of my life, I've been making my bed just about every morning. Just recently, I discovered, after 16+ years of marriage, that my husband does not like to have the sheet and blankets tucked in on his side of the bed. Really! How could anyone *not* like to have everything all tucked in nicely? And he's the one who always (OK, not always...and not even frequently...I'd have to say it's more...occasional...rarely, even) talks about how he loved it when his mommy used to tuck him in snugly at night. I'm the one who hangs her legs outside of the bed at night (is that too much information?) It doesn't quite compute. Since this discovery, I've been not-tucking Hubby's side of the bed. If he's noticed, he hasn't mentioned it, but it's a little thing, and if it makes him more comfortable, I'm all for it. My children do not make their beds. At 11 and 8, the older two certainly ought to be capable, but I've given them a pass because one of them sleeps in a loft and the other sleeps in a bunk bed. Have you ever tried to make a bed while you're on the bed? It's not an easy task. I feel like I'm neglecting my motherly duty, not teaching them how to make a bed...maybe I'll send 'em to military school or something...but to me, it's not worth fighting over. Just recently, however, I started not-tucking one side of MC's bed when I change his sheets. He's on the bottom bunk, and I've just been tucking the far side--over by the wall, leaving the side he gets in on free. And guess what! The bed stays much neater! The tucked-in side stays tucked, so all MC needs to do in the morning to "make" his bed is pull the other side up toward the head of the bed. Wow. So easy. And I never knew. Unfortunately, this doesn't work on my bed, since we've got people getting in from both sides (and the person with the tucked side likes to hang her leg out). By the way, if the whole one thing/one room/retreat from chaos justification for making the bed doesn't sway you, consider this: a recent study showed that people who make their beds sleep better. Mom was right: better make your bed! Look at me, celebrating all kinds of holidays I normally don't...what's gotten in to me? Anyway, I was going to wait and publish this post super early tomorrow morning. Tomorrow, because tomorrow is actually Groundhog Day, but super early so if you wanted to do a groundhog craft on groundhog day, you'd have some time to get your mind around changing your plan for the day. Oh, yeah, and gather some supplies. However, An Almost Unschooling Mom (who really should be added to the cool kids' listing over there -->), posted her groundhog craft today, which means it's OK. Right? It's OK that I'm doing this? The kids had no idea what Groundhog Day is, so first we read Groundhog Day from the Celebrations in My World series. This non-fiction book has sections on groundhogs and hibernation, as well as what Groundhog Day is, how it's celebrated in a few different locations, and "bios" of a few famous groundhogs. Armed with our new groundhog knowledge, we made a cute little peek-a-boo groundhog craft, using a plastic cup, popcicle stick + wooden spoon (I was planning to use a tongue depressor, but was astonished to find we were all out), some felt, and googly eyes. I won't give you a blow-by-blow (or glue-by-glue) account, because I think you can probably figure it out. But if you can't, just search for peek-a-boo groundhog craft--it's all over the internet. Just keep in mind, you don't have to follow the directions--you can substitute paper or craft foam for the felt, use a printable groundhog instead of making your own, use a stick or pencil for the tongue depressor, use paper or draw on eyes...it's totally up to you. Plus, you'll notice we used white felt to simulate snow (because we do still have a bit of snow here)--all of the instructions we came across used green for grass. The kids had so much fun playing with their groundhogs, both in and out of the burrows. Roger's little guy looks pretty apprehensive upon seeing his shadow, doesn't he? He also kinda looks like a bear...which is OK, because bears also hibernate. Next, we read Substitute Groundhog by Pat Miller, illustrated by Kathi Ember. On February 1, Groundhog is feeling under the weather, so he makes an appointment with Dr. Owl, who tells Groundhog he needs 2 days of bed rest. Groundhog decides to advertise for a substitute groundhog, who needs to be able to fit in the burrow, see her shadow, and pop up and stay up. Lots of animals try, but only one has all the qualifications--the kids had fun guessing which animal would get the job. We are also planning on going outside on Thursday to see if we have shadows. I'll be marking their shadows, using sidewalk chalk, so the kids can see how shadow size and direction changes throughout the course of a day. And we might just have to play a game of shadow tag, too.